For those who are experiencing the negative health effects of being underweight, or for athletes who would like to gain muscle mass in order to improve in a sport, it may be tempting to eat greasy, fatty foods or use supplements to gain weight quickly. Fortunately, there are many recommended ways to put on pounds and increase strength more safely and naturally. 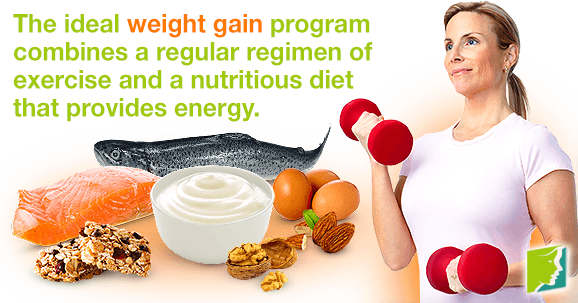 The ideal weight gain program combines a regular regimen of exercise for muscle growth and a nutritious diet that provides the energy and support for this new growth. It is important to attempt this at a healthy, sustainable rate: for example, gaining 0.5 - 1.0 pound per week can be achieved by eating 250 - 500 extra calories per day. These calories should come from wholesome foods rich in carbohydrates, proteins, vitamins, and minerals. Exercising in tandem ensures that these calories aren't simply converted into fat but are instead used to stimulate muscle development. All extra calories needed for adding mass can easily be found in the right foods, rendering expensive protein shakes for weight gain unnecessary. Simply adding nutrient-rich foods to your current meals will start to add up before you know it. Carbohydrates. These macronutrients are a quick and important energy source and should make up 50 - 60% of your caloric intake. Opt for whole grains and dense cereals, such as pumpernickel, granola, and bran. Pasta, potatoes, and beans are also excellent sources of carbohydrates. Proteins. Another 10 - 15% of your diet should come from proteins, which provide energy over longer periods of time and stimulate tissue development. Milk, eggs, and lean meat are a classic solution.Healthy fats. The rest of your diet, approximately 20 - 30%, should come from fats, such as found in nuts, seeds, fish, and yogurt. Exercise is the other half of the weight gain equation. If you want to develop muscle mass specifically, it's best if you focus on strength training at least twice a week. Try to use movements that exercise more than one muscle group at a time, since this will allow maximum muscle growth when compared to machines or localized exercises.Try starting with two or three sets per muscle group with four to eight repetitions per set. As you develop your strength, you can gradually add on more weight. Cardiovascular exercises can also be a helpful way to break up an exercise routine. Remember, it is equally important to stay hydrated and get adequate rest so that your muscle tissue can repair itself and develop properly. Depending on your body type, your rate of muscle and weight growth will vary, but with a healthy routine like the one described above, you will be adding strength - if not bulk - to your frame in no time. Follow the link below for further information on how to deal with weight gain during menopause.